Baltic Ground Services (BGS), an international provider of ground handling and into-plane fuelling services, in cooperation with NFQ, a joint Lithuanian and German capital venture offering digital business systems, programming solutions and Internet marketing services, have created and implemented a new Departure Control System (DCS) designed to facilitate registration and boarding processes for passengers travelling on direct flights (point to point). The new system has been already implemented and successfully used in serving Wizz Air, Small Planet Airlines and other airline flights from Vilnius International Airport. In the nearest future the company is planning to implement the system across the entire network of airports served by BGS. The new web-based departure control system is designed to facilitate the complex proccesses of check-in, boarding and baggage registration. The full system package includes two-dimensional code scanners, special boarding pass printers and computers for the passenger handling agents. “Upon the decision to embark on such an ambitious technological project we focused on finding the most competent and professional partners out there. Needless to say, we were very pleased to find a highly competent and innovative team here, in Lithuania. The reliability, professional skills and flexibility of NFQ specialists have enabled us to design a system which is capable of serving the highly specialized and complex needs of the aviation industry. 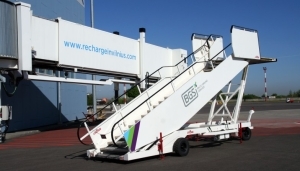 I am confident that the new system will significantly ease the daily burden of passenger handling specialists,’ said the CEO of Baltic Ground Services Saulius Batavicius. When designing the new departure control system NFQ had to focus not only on the specific aspects of the airport market segment but also on the highly restrictive regulations of the international aviation authorities. The systems of such type must comply with the strict IATA (International Air Transport Association) requirements, so the NFQ team had to make sure that the system was capable of creating, receiving and recognizing all the IATA standard messages. “The utmost attention was paid to the user interface, system speed and security. We are confident that the benefits provided by the new system will be immediately felt not only by the airport personnel but also by the key component of the aviation industry – air passengers. For instance, it is highly common that families awaiting registration approach a check-in desk with several passports and flight tickets in hand. With the help of the new system the airport personnel will be capable of completing the check-in process much faster and with added convenience as the system can instantly scan all the documents and print out a required number of boarding passess. The latter can then be scanned to check the relevant passenger in the appropriate database thus ensuring extra safety for both airport personnel and all passengers. Moreover, the new system will undoubtedly help to save time, which, as we all know, is money,’ commented S.Batavicius. Yet another system advantage is the fact that it can be relatively easily implemented and adapted for the use in multiple airports. It enables the continuously geographically expanding BGS to smoothly introduce the system in any new market. Upon the successful implementation of the DCS project, Baltic Ground Services and NFQ are already working on designing an innovative aircraft ground handling and accounting system aimed at facilitating the processes of fuelling, aircraft food supply management, record keeping, pricelist management, etc.